Whether you have roof damage or need a full replacement, there are some vital things you need to consider before you choose a roofing contractor. Home improvement spending in Canada reached 72.7 billion dollars in 2017. That is an all-time high for the country. So with that much spending comes a slew of contractors and home professionals. If you’re looking for roofing services, how can you know you’re picking a reliable company? Read on for the five most important questions to ask your potential professional roofing services provider to ensure that you make the right choice. There are two types of insurance you should ask about. The first is called Workmans’ compensation and the second is liability insurance. Your professional roofing services provider should have both. 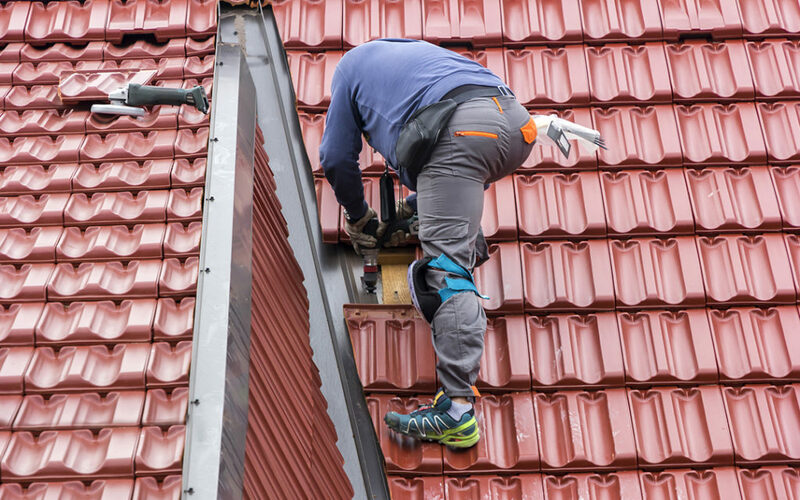 Workmans’ compensation protects homeowners if a worker is injured on your roofing project. Liability protects your home if any damages take place during the project. Some contractors use sub-contractors during labour. Make sure that if they do that the sub-contracted workers are also insured. 2. Do They Have a Roofing Contractor License? Having a license ensures that a professional roofing services provider abides by the laws and standards set by local authorities. Licensing requirements vary by region. So you should first check what your local laws require in the way of licensing. Ask your contractor if they are fully licensed. And once you know, check with your local licensing offices to verify that their license hasn’t expired and that your potential contractor doesn’t have any unresolved violations. 3. Do Their Professional Roofing Services Come With a Warranty? There are two types of warranties you’ll want to ask about. The roofer’s warranty covers the work provided by contractors and usually lasts one year. Some may offer longer warranties, so don’t be afraid to ask. The second warranty is the manufacturer’s warranty which covers the materials. Ask your roofing contractor for the details and get a length of coverage in writing for both. 4. How Do They Ensure the Protection of Your Home? Some roofing jobs require contractors to have access to the inside of the home and attic. Make sure to clarify if they’ll need access. If they do, don’t be afraid to ask how the screen their employees. Make sure to ask about their procedure for protecting the interior of your home from the materials used during the job. 5. Do They Have a Portfolio? Truly professional roofing services will have a portfolio of their work. This gives you a perfect insight into the quality of their work. If a professional portfolio isn’t available, you can ask if they have any current or recent clients whose work you can see. Roofing repairs and replacements can be costly. Don’t be afraid to ask for examples so that you know what kind of quality to anticipate for your money. You have every right to be selective when considering that you’re asking someone to enter your home, work in a potentially dangerous environment, and do work on one of your homes most essential elements.